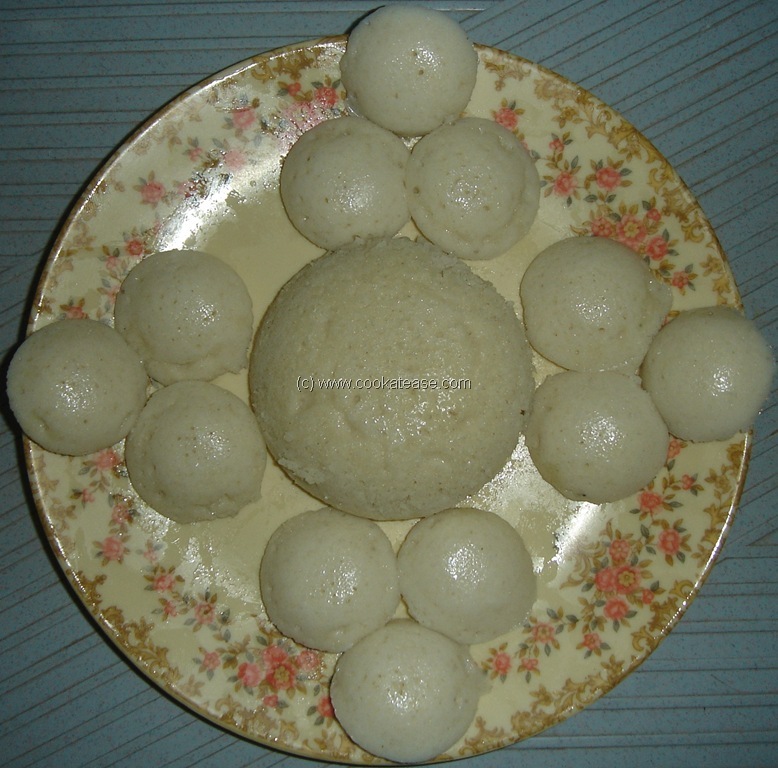 Idli and mini idlis are well-known south Indian dishes. 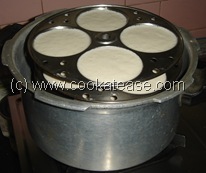 As idlis are steam cooked and oil free, they are highly suitable for all irrespective of age group. Cooking time: less than 20 minutes, if idli batter is available. 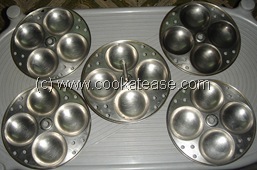 Take idli moulds, grease them with oil or ghee. 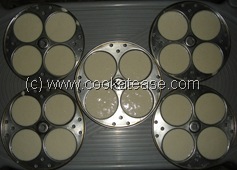 Mix the batter well; it should be like a cake batter to fall freely but should be thick; add little water if required. 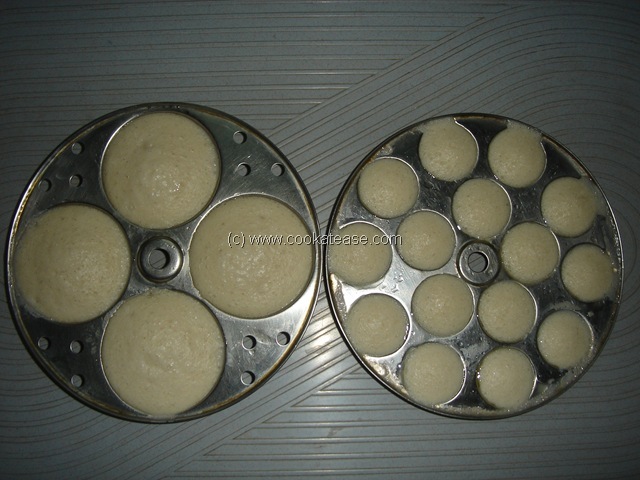 Fill up moulds with idli batter; if you want to cook mini idlis, use mini idli mould. 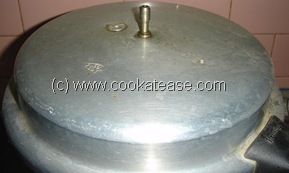 Now carefully keep the mould in cooker; close with lid and do not place cooker weight. Steam cook in low flame for 8 to 10 minutes. 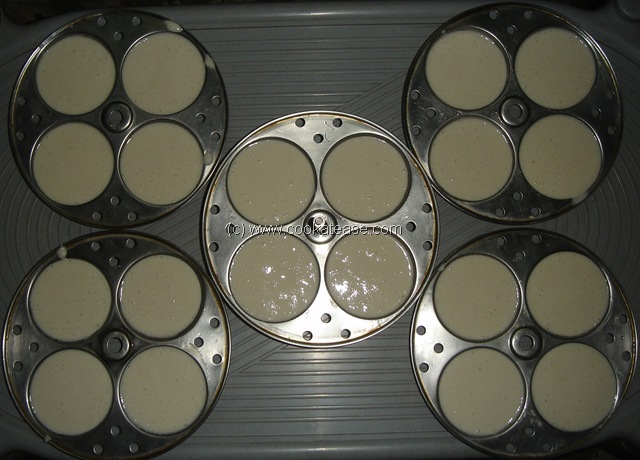 Remove moulds from pressure cooker, allow them to cool. Remove idlis, gently from the moulds with knife or spoon. 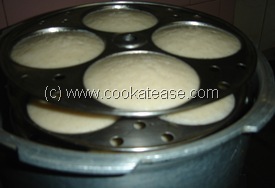 Store idlis in a casserole (hot pack) to keep them hot. 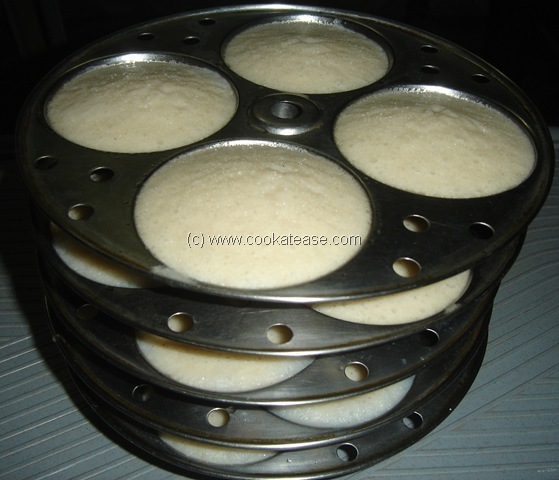 If you add too much water to idli batter, idli will not be fluffy. Refrigerate idli batter to keep it fresh. Serve Idlis or mini idlis with chutney and sambar. i like your batter receipe. I am so interested in your website, thank you so much for posting all this healthy and delicious-looking recipes! 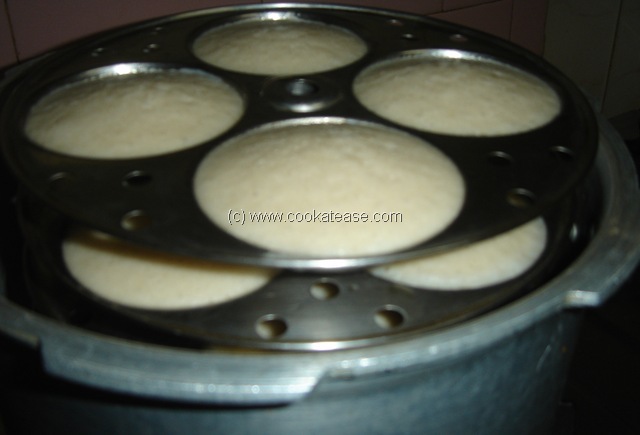 Can I make idli in my pressure cooker without going out and buying more kitchen equipment? I am not sure if you just steam these or cook them under pressure, can you please clarify? What accompaniment for idli can you suggest for a child who does not like spicy food? 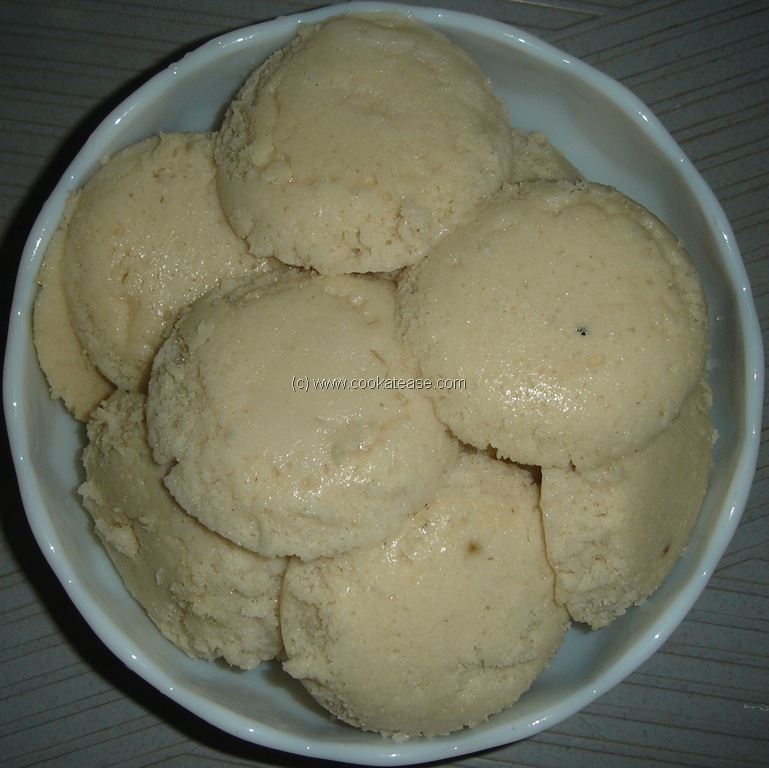 We are new to Indian cooking but are gluten and dairy free, so we are interested in idli as a snack food for us. I think my son would like it. 1. Your pressure cooker can be used to cook Idli. No pressure cooking is required. Only steaming has to be done by allowing the steam to vent out. 2. 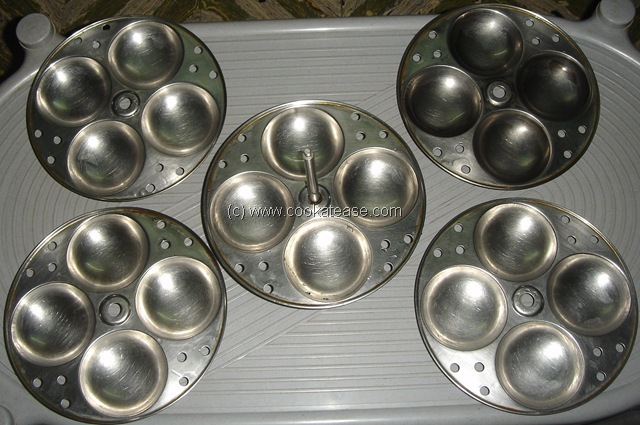 If you don’t have Idli moulds as shown in the above pictures, you can use any other small metallic bowls by greasing the inner surface with light coating of edible oil. 3. Regarding accompaniment for Idli, sauce will do or refer my ‘Chutney, Sauce, Thokku’ section. Use less spices to suit your requirement.